After what feels like an impossibly long, frigid NYC winter, summer is finally here. And while you may be tempted to load up the car with beach bags, sit in shore traffic for three hours, and wrestle a Snooki look-alike for a spot on the sand, we’re here to tell you there’s a better way to cool off this season. The tristate area boasts miles of scenic state parks, packed with peaceful waterfalls, ponds, and even a few secluded beaches, all just a short drive away (we even figured out how long you’ll be on the road once your vehicle escapes Manhattan). So forget the beach badges (but splurge on some new water shoes) because these spots are actually are worth the trek. 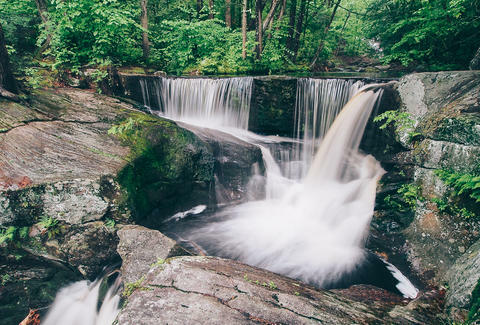 Nothing quite says summer like hiking up to a waterfall -- and this park packs five of them. Not only that, but several of the pools around the falls are also deep enough to swim in, making this a popular spot for adventure seekers. After taking a dip (carefully and at your own risk, of course -- the state recommends you swim in nearby Stratton Brook State Park instead… but they’re not saying you’re in trouble if you stick with Enders Falls) you can seek out the letterboxes that can be found throughout the state park, on various trails and sites of interest like scenic overlooks. Just be wary about climbing the rocks near the waterfalls -- they can get extremely slippery, and you wouldn’t want to spend the rest of the summer in an ankle brace. The Drive: Two hours and 10 minutes via I-684 and I-84. If you want to live out your wildest Dirty Dancing/Catskill fantasies and recreate this scene, Esposus Creek is the closest you’ll get. This creek runs through the Catskill Mountain towns of Phoenicia and Saugerties along Route 28, aka “New York’s Adventure Route” and offers several entrance options along the roadway. And while you could spend the afternoon just lazily floating around, Esposus Creek is actually best known for its tubing and trout fishing. So before you towel off, gear up at Town Tinker Tube Rentals and get your adrenaline rush on the rapids. The Drive: Two hours via I-87, then follow NY-28 through prime Catskills scenery. Remember when you used to get together with your friends and pledge that this summer, this year, would be the best you ever had? And you fantasized about trekking to secret swimming holes, hidden by trees and cliffs, and plunging into them with a rope swing? 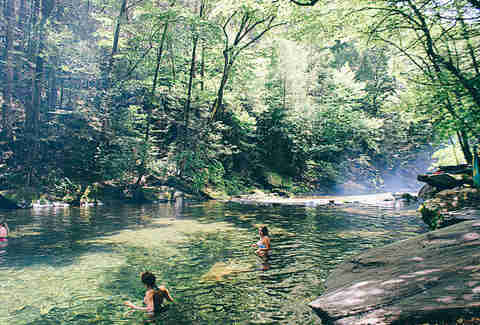 Peekamoose Blue Hole is the place you were daydreaming about. It’s a free, public swimming hole, completely made by nature, in the Sundown Wild Forest, an area of the Catskill Forest Preserve. It’s so pristine, the creek that fills it even provides drinking water for NYC. That said, the weekends at Blue Hole get pretty busy, so a weekday is your best bet for having the place (relatively) to yourselves. The Drive: Two hours and 30 minutes via NY-17 and NY-42. We’ll admit that one of the best parts about heading to the “shore” for a beach day is being able to sprawl out on a soft, sandy beach, sans footwear. Well what if you could do that, but instead of being surrounded by crowds of sunbathers, you’re instead surrounded by an entire forest? 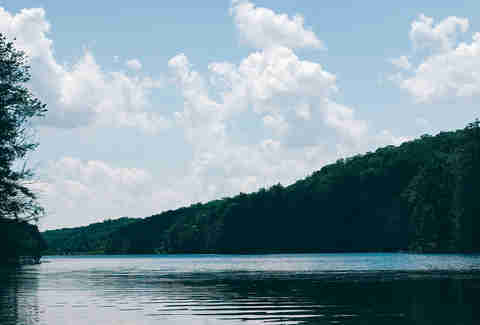 This 1.5-mile lake sits in the 14,000 acres of Fahnestock State Park, so there are 50 miles of hiking trails (including the Appalachian) within its borders. Explore some of those, settle in for a picnic, then either cool off or rent a small boat to explore the length of the lake. If you’re driving, parking at the lake is $7, but we think that’s a small price to pay for sand between your toes. The Drive: One hour and 30 minutes via the Taconic State Parkway in Putnam Valley. Okay, before you get all skeeved out, swimming in (SOME parts of) the Hudson is not only perfectly sanitary, but downright enjoyable. And in Westchester County, where most of the swimming locations are reserved exclusively for the bridge and tunnel crowd (read: county residents) there is an exception: Croton Point Beach. For just $4, you’ll have access to this large, sandy beach that juts up against the river, surrounded by cliffs, hills, and all the natural beauty that inspired a whole school of painting. There are also grassy areas for a picnic, plenty of shady trees to curl up under, and (of course) no beach traffic. The Drive: One hour and 10 minutes via I-87 and the Sprain Brook Parkway. The Drive: One hour and 45 minutes down a nice long stretch south of the Jersey Turnpike, then head east via US-206. 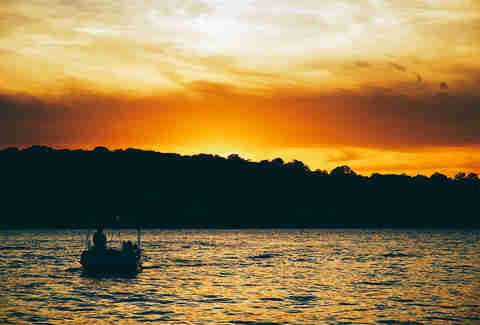 Come summer, Lake Hopatcong is Jersey boating central. Everyone from waterskiers to speed boat enthusiasts to party barges descend on this lake. However, that doesn’t mean there aren’t swimming holes to be found here, too. (Lake Hopatcong is the largest lake in the Garden State, after all.) If you’re looking for a party, for example, you’ll find it in Byram Cove, where boaters frequently anchor together on weekends, creating an impromptu swimming hole. 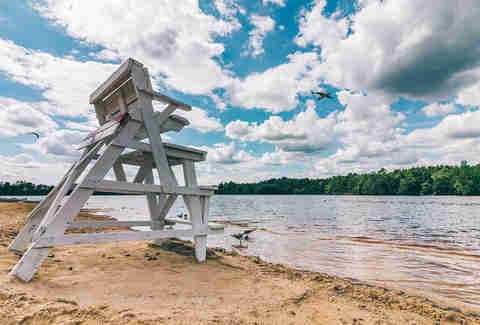 Lee’s County Park and Hopatcong State Park, though, are public swimming area you can access without sinking your life savings into a money pit (read: buying a boat). Afterwards, there are several lakefront restaurants along Lake Hopatcong, like Alice’s Restaurant. Before you leave, though, be sure to get in on that classic Jersey tradition of stopping at a classic diner for a pork roll/taylor ham/artery-clogging deliciousness. The Drive: One hour and 30 minutes along I-280, then I-80. After you clear the North Jersey suburbs on I-80, there are several scenic spots along the Delaware Water Gap. This swimming hole is unlike any other on this list, because it’s not a lake or pond -- it’s an old flooded mining quarry -- and you won’t have to worry about an old farmer chasing you off the property. The Quarry Swim Club has been a destination for Jerseyans looking to escape sweltering summer temps for more than 90(!) years. The mine suspended operation in 1916, and fresh water quickly filled the quarry, turning it into a 55-foot-deep, natural lake. Unfortunately, this natural wonder sits on private property, so you’ll need to be a passholder to swim, and six trips will set you back $106. That may be steep, but the price comes with more than swimming access: Think a huge grove with plenty of picnic tables, a volleyball court, several floating docks, and lifeguards. After spending the winter cooped up in your 350-square-foot studio, you’re bound to want some space to stretch out. You’ll find plenty of it at Bigelow Hollow, the 9,000-acre state park that spans much of northeast CT. Three large ponds with swimming and boating access can be found within the natural wilderness here, as well as lots of fishing holes, too. Breakneck Pond is the place to head for some privacy, as it’s a secluded lake you can only reach by foot. If you’re not interested in a hike, though, Bigelow Pond is at the park’s entrance -- and this is the spot to launch a kayak and picnic, too. 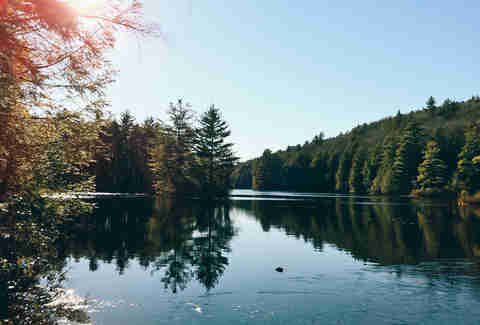 Last, there’s the 300-acre Mashapaug Lake, which is easily accessible at the end of the park’s main entrance road. After spending so much time in the wide open wilderness, we won’t blame you if start considering moving to the ‘burbs. The Drive: Two hours and 20 minutes via CT-15 and I-84 towards Boston. Ringwood, even though it’s surrounded by crowded North Jersey ‘burbs, is something of a nature-lover’s oasis. It’s situated in the foothills of the Ramapo Mountains, and 70% of the township is dedicated to open space. That means there’s plenty of parks, hiking, and the like -- but it’s also home to an Olympic-sized, spring-fed natural swimming hole: The Highlands Natural Pool. It was carved out more than 80 years ago, and is constantly refreshed by the spring that fills it. So this is one pool you won’t leave with a green, chlorine-scented hairdo. The best part? It’s located on the outskirts of Norvin Green State Forest, a wildlife sanctuary with 10 hiking trails. The Drive: One hour and 15 minutes via NJ-208 and I-287.